Your Outcome: Identify 3 things going well and 3 things to improve based on you results for this week. Welcome to Day 6 of 7 Days of Agile Results. Agile Results is the productivity system introduced in my best-selling time management book, Getting Results the Agile Way. 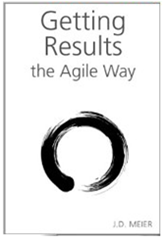 On Day 1 of Agile Results – Sunday (Getting Started), we took a quick look at Agile Results. On Day 2 of Agile Results – Monday (Monday Vision), we identified our 3 Wins for the Week, and our 3 Wins for Monday. On Day 3 of Agile Results – Tuesday (Daily Outcomes), we identified our 3 Win for the day. On Day 4 of Agile Results – Wednesday (Daily Outcomes), we identified our 3 Wins for the day and did a checkpoint on how we are doing overall towards our 3 Wins for the week. We readjusted as necessary so we could make the most from the days we have left. On Day 5 of Agile Results – Thursday (Daily Outcomes), we identified our 3 Wins for the day. Use Friday Reflection as a way to invest in yourself, reinvent yourself, and renew yourself. If you do this well, this is the secret of continuous improvement. Each week, what you learn from Friday Reflection can help you tune and improve your results so you get better and better. One of the most common patterns is to simply lose sight of what we set out to achieve for his week. That’s why thinking of 3 Wins for the Week is so powerful. It gives us a target. We check ourselves during the week, and adjust our course. Then Friday is where we really peer into our personal process and find ways to improve it. The goal is to carry the good forward and build better habits. See what starts to happen? You start to notice your own patterns. This awareness becomes your advantage, when you use it to change what’s not working, and do more of what is working It’s a way to improve your personal habits and streamline your results. You completed none of what you set out to do for the week. Pay a lot of attention to this. What’s important is that you know “WHY” you didn’t complete what you set out to do. If you traded up for higher value impact, congratulations. If, you simply got randomized, and distracted, then notice how much better today would feel if you had stayed focused on your 3 outcomes. Also, make it a point to identify how you choose better outcomes for the week. You want to really start to learn what sorts of things are high value results for you. You completed some of what you set out to do. Congratulations. At least that’s some progress you can be proud of. Use your results as feedback. Did you complete your best opportunities? Or did you simply go for low-hanging fruit? Did you try to accomplish more than was reasonable within this time frame? Use your answers here to gain tremendous insight into your own bottlenecks and ability to execute. If you are simply biting off too much, then try to improve your ability to estimate what you can achieve within a week. You’ll get better at this each time. You’ll start to be able to size up your work week simply by eye-balling it. You’ll develop an intuitive ability to guestimate your efforts, which will help you right size your wins, and focus on the highest impact results. This, in turn, will help you build momentum so that you can create a snowball of progressive impact. You completed what you set out to do, but it doesn’t feel like impact. This is a good learning, as well as a good reminder. First, make sure you aren’t throwing your results away. Check to see if you are giving yourself enough credit for achieving your results. Practice an attitude of gratitude. Next, see if you can put your finger on “WHY” it doesn’t feel like impact. Did you simply have lack of clarity around what would be significant for this week? Did you simply set your bar too low? The best insight here is to gain increasing clarity on what types of outcomes really constitute high value results. Most important, relax and truly embrace Friday Reflection as one of the best ways that you can improve your personal performance, in a simple and almost automatic way. Just by asking these simple questions, you start to gain awareness and you start to gain more clarity on what works best for you, and what your true execution abilities are. What’s even better is that you’ll naturally start to improve here simply by paying attention to these key questions. They’ll help you see what you did not see before. And, if you make this Friday Reflection a simple way to check in with yourself each week, you’ll find yourself paying more attention throughout the week. And, you’ll start to make little adjustments here and there that start to help you focus and prioritize on higher value outcomes and activities. You will gradually find that you are achieving better and better results, with less effort and more clarity. You will unleash the productive artist that’s already within you, as well as tap your most inspiring abilities, skills, and strengths. This is how you will fan your flames and set your productivity on fire … the quiet way … the Agile way. Welcome to your private victories that last a life time.